Following the kind comments of the creators of such beautiful blogs as Gourmet Fury, Bread + Butter, Dhaleb, Reg And Mitzi, and many other friends, I thought the time was ripe to post a couple of simple but colorful sushi recipes than can be easily expanded for home parties and impress your guests! My vegan and vegetarian friends should not worry as I have explined possible adaptations according to their priorities at the end of such postings! No need to be too precise about exact quantities here as personal tastes can (and ought to) be different! -Tobikko (Flying Fish roe): as fresh as possible. -Tempura kasu: these are the pieces of batter found in the oil after frying tenpura. The Japanese do not throw them away! Scoop them out as early as possible and lay them on a piece of paper kitchen to take off excess oil. Let them cool completely. If you do use them immediately, store them by dee-freezing them inside an airtight vinyl pouch! -Coarsely cruched peanuts. These with the tenpura kasu will add a welcome crunchiness. Mayonnaise sold over the counter can cloying sweet. I would make my own, which is not difficult at all: one egg yolk + salt + pepper + vinegar. -Cucumber: finely chopped. Cut the cucumber in 5 cm, 2-inch long pieces. Cut each piece into thin slices. Cut the slices again into very fine strips. -In a bowl drop the scallops cut into small pieces. Add the tobikko/Flyiing Fish roe, tempura kasu, crushed peanuts, mayonnaise and chili pepper. Mix well. Taste and rectify the seasoning if needed. 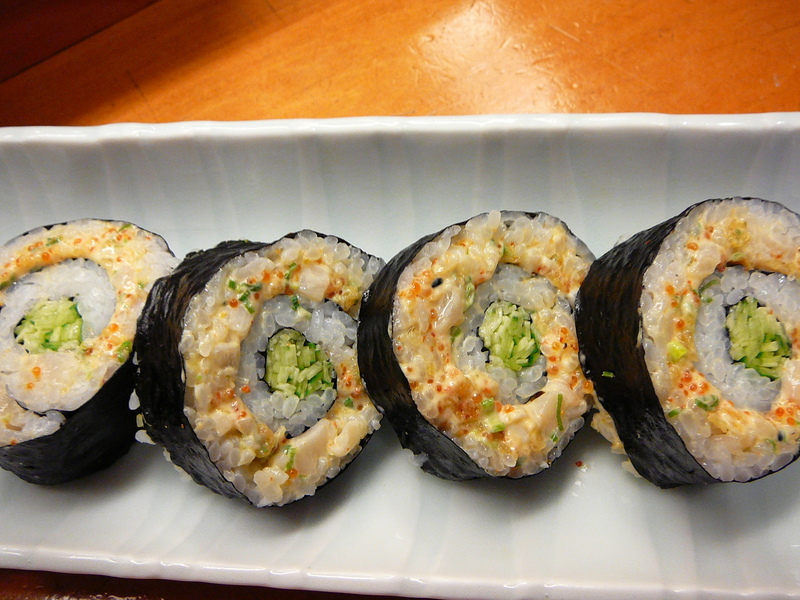 -Spread a large sushi roll mat out and cover it with a sheet of nori/dry seaweed. -Spread a layer of sushi rice over the whole nori/dry seaweed as equally as possible. Careful with the quantity. Too much and you won’t be able to roll it! -Leave a small strip space at one extremity. Line with the cucumber in a half centimetre/less than half an inch wide strip. -Leave a space between the cucumber and scallops mixture to obtain the same pattern as shown in above picture. Spread the scallops evenly. Leave a space at the other extremity to allow for a tight closing of the roll. -Carefully roll the sushi from the cucmber end. Once completely rolled, pressed gently and evenly so as to allow the nori/seaweed to seal the roll. -Unroll the mat. Cut the roll and serve at once. -There is no real need for extra soy sauce or whatever dessing, but this a personal taste. -Instead of using scallops, use mushrooms. White coloured and soft varieties such as button mushrooms, shimeji or even eringi are best. Cut the mushrooms and sprinkle with lemon juice to prevent them from darkening. Fry them in olive oil until they are soft. Let them cool completely and drain them thoroughly. Do not throw the juices away as they can be used in delicious sauces or soups. Do not be afraid of varying that recipe. It is very simple!